The University of Makati has launched a program giving its nursing students an opportunity to advance their skills in Japan. BRIGHT FUTURE. 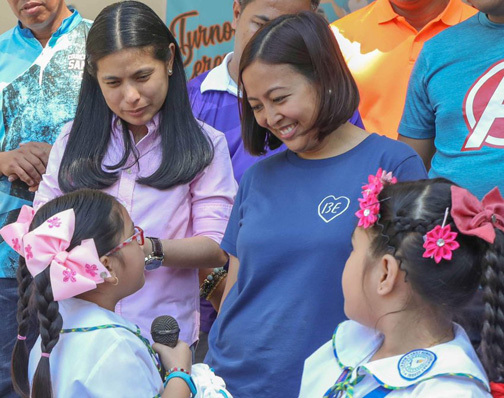 Makati Mayor Abigail Binay (right) and Vice Mayor Monique Lagdameo (left) beamed with pride and joy as they listen to the message of Gaea Roz Beronilla, a Grade 1 student from East Rembo Elementary School. Gaea expressed her gratitude to the mayor for the benefits Mayor Abby has given the students—from free school supplies to uniforms, rubber shoes, dengue kit, hygiene kit, and even rain gear. Gaea reassured Mayor Abby and Vice Mayor Monique that they will repay the goodness of the city government by studying hard for their future. Mayor Abigail Binay said the Japan Internship Program for nursing students was launched in partnership with Wakatakedaijukai (Japanese Social Welfare Corporation) and the Asiantouch International Training Institute Inc.
Binay thanked UMak and its partners for the innovative program, which will also give the students an opportunity to experience Japan and be immersed in its culture. “I would like to thank UMak and its partners for facilitating this learning program. We already had two nursing students who were sent to Japan last year. We look forward to helping more nursing students and graduates increase their employability,” Binay said. Dr. Maria Fay Nenette Carriaga, dean of UMak’s College of Allied Health Studies where the Center of Nursing is housed, said Licca May Andrada and Cathyrine Ceria, both nursing students in their senior year, were chosen as interns during the pilot implementation of the program. “Ms. Andrada and Ms. Ceria were sent to Japan last Sept. 5 until Nov. 1 for their internship. They were accompanied by Professor Cynthia Umila, the clinical chairperson of CON,” Dr. Carriaga said. “They were chosen among the senior nursing students who have already taken Hospice and Palliative Care (elective course) and are enrolled in Nursing Care Management 106,” Carriaga added. The Memorandum of Understanding between UMak and its partners for the internship program was signed on April 24 by Dr. Elyxzur Ramos, UMak’s vice president for academic affairs, Kazuo Takeda of Watakedaijukai, and Ma. Jocelynn Rodriguez of Asian Touch International in Quezon City. Under the MOU, Wakatakedaijukai will shoulder the internship expenses, including round-trip airfare, meal and accommodation allowances, and a monthly living allowance of 65,000 JPY during the internship proper for each intern. Wakatakedaijukai will also answer for the training expenses of interns with Asian Touch International where they will undergo a 300-hour Nihonggo and socio-cultural classes before they leave for Japan. Meanwhile, Anthony John Domingo, executive director of the university’s CON, said that the internship is aimed at helping students increase their knowledge and develop their skills in elderly care. Domingo said that as interns, nursing students are given the opportunity to learn and practice their skills in the Care of the Elderly Component. They will assist in bio-psychosocial support care for patients, provide care and support for people with special needs, and assist in bathing of patients. They will also be given opportunities to assist in safe transport and mobility of patients, apply basic first aid, and respond to emergencies with basic life support. “We are very grateful for the successful pilot implementation of the internship program. Although right now, the program is still being finalized. We are planning to offer the program for registered nurses, too,” Domingo said. Professor Rosalie Catanghal, program chair for CON, said that under UMak’s current curriculum, a nursing student has to render a total of 2,295 internship hours to graduate. In June 2018, UMak obtained a 75 percent overall passing rate after 21 of its graduates passed the Nurse Licensure Examination. UMak COAHS currently offers various undergraduate degrees, namely: Bachelor of Science in Nursing, BS Radiologic Technology, Bachelor of Science in Pharmacy with enhancements in Pharmaceutical Marketing, Associate of Applied Science in Pharmacy Technology. COAHS graduate degree programs are Master of Arts in Nursing, Master of Science in Radiologic Technology, and Master of Business Administration in Healthcare Management. Topics: University of Makati , Japan Internship Program , Abigail Binay , Asiantouch International Training Institute Inc.